The typical truss is recognizable by its triangular shape and is most often used in roof construction. Each roof truss has pros and cons, and it must be designed to suit specific conditions and purposes. Have an idea what type of look you want your finished building to have when selecting the type of roof truss, as it often dictates the final shape and slope of your roof. When Does a Roof Truss Make Sense? Workers with less experience can install roof trusses, reducing labor costs and facilitating the installation process vs. other roof suspension systems. Some designs can require having fewer load-bearing walls as these trusses can be used for achieving longer spans, creating open living spaces. Savings in building materials can result. Often, when combined with a truss, lighter and less expensive materials can be used throughout. Installation of trusses can be achieved in one day, as they can be prefabricated near the site and erected using a lightweight crane or construction equipment. Roof trusses come in many types, but the four variants below comprise the lion's share of constructed ceilings. Parallel chord roof truss. Commonly used in cathedral ceilings, the cost of this truss is higher because it requires the use of steel members to serve as bracing. The complexity and numerous wood members used represent another disadvantage. Thermal bridging caused by the steel braces can decrease energy efficiency, but many consider the simple lines of the parallel chord roof truss both functional and appealing to the eye. Raised heel roof truss. This method allows for greater energy efficiency. 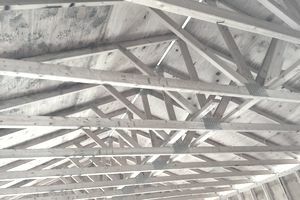 The raised heel roof truss reduces condensation problems since the truss creates a vapor barrier and is commonly seen in humid climates where mold is a common issue. This truss requires a soffit siding and additional insulation work from the onset, which elevates construction costs. The raised heel roof truss can be designed to span an area and provide full-depth attic space. Scissor roof truss. Also commonly used in cathedral ceiling for its construction convenience, the scissor roof truss reduces the need for a bearing beam. It uses lower chords that slope inward, instead of being horizontal. One of the disadvantages of using this type of truss is the problem in completing insulation, which, while already hampering aesthetic appeal, also hikes construction costs. Dropped chord roof truss. The dropped chord variant is composed of a convention truss, with a secondary chord truss suspended below to help reduce uplift. Similar to the raised heel truss, this type also creates a vapor barrier creating great insulation characteristics. Vapor barriers need additional blocking and siding in the intersection of walls and ceilings, adding to the construction cost. Certain factors have an important impact on the cost of the truss. Studies from the mid-2010s have shown that, for an average American house, the roof truss can cost anywhere between $12,000 and $15,200. A breakdown of the cost often leans heavily on materials, so there isn't much room to save money. For example, the roof truss labor costs often exceed $2,500. A crane rental will be more than $700. Decent-quality lumber is essential, almost always exceeding $10,000, and the scrap disposal costs between $200 and $500. Conventional framing is typically at least 60 percent more expensive than a prefabricated truss and will cost more in materials. This consideration is important if customization is a priority to the project. In general terms, and if you want to save money while being practical, a 4/12 pitch roof is the most economical. It is strong but shallow, maximizing the use of lumber using available and ordinary lumber sizes. A 4/12 pitch means that the roof rises 4 inches for every 12 inches of run. There's already been mention of using a prefab set-up when appropriate, and you can always attempt to negotiate a lower labor fee for larger projects. Generally, though, since most of the cost of a truss lies in the raw materials, saving a significant percentage on the finished project isn't likely to happen.